The WSU Physics and Astronomy Club promises “a smashing good time” during the student group’s 14th annual Pumpkin Drop on Saturday, Nov. 3, at WSU Pullman. The free, “gravity-bound extravaganza” will celebrate the fun side of science by dropping pumpkins of all shapes and sizes from the highest point in town: the 12th floor of Kate B. Webster Hall. The pre‑WSU football game festivities are part of Dad’s Weekend and feature demonstrations and entertainment for kids of all ages beginning at 11 a.m., with the main event at 12:45 p.m. 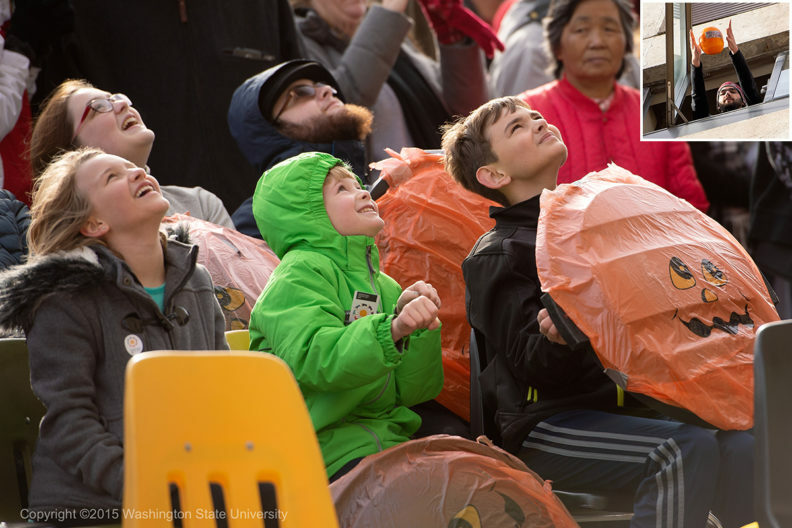 Photos and videos of previous Pumpkin Drop events can be found on the Department of Physics and Astronomy website. For more information, contact Robin Stratton, Department of Physics and Astronomy, 509‑335‑9532, rstratton@wsu.edu.